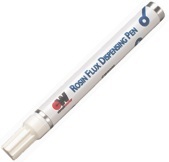 CW8200 flux-dispensing pen is ideal for applying fluxes with precision accuracy and control.  Chisel-tip marker delivers flux directly to the surface.  Easily remove flux with a CircuitWorks Rosin Flux Remover Pen.  Noncorrosive, nonconductive Type R soldering flux.  Meets mil-F-14256 F Type R and ANSI/PC J-STD-004, Type R0LO. RoHS compliant.